Bushman delivered a Clamp Arm Inverter to Cameron, a leading provider of flow equipment products, systems and services to worldwide oil, gas and process industries. 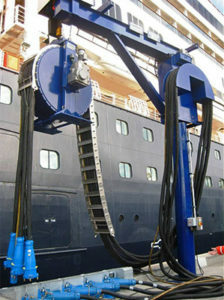 Bushman Equipment Inc has enjoyed, since 2009, a partnership with Cochran Marine, LLC, a developer and integrator of a patented, shore-based, electric power system for cruise ship terminals. 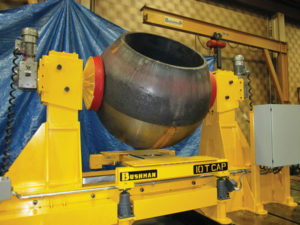 Bushman designs and builds special cable positioning devices (CPDs) to handle Cochran’s power systems. Bushman teamed up with J&B Equipment, Inc. to design and build this 15-metric ton, ceiling-mounted, hydraulic scissors lift station. 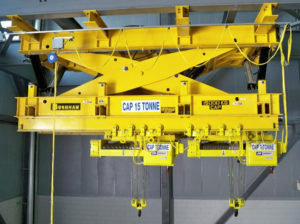 Two 7 ½-ton patented monorail hoists lift a complete jet engine into position so that the engine modules can be secured to struts that are supported by eight monorail trolleys on the scissors lift. The scissors lift then moves the engine up or down to the desired working height. 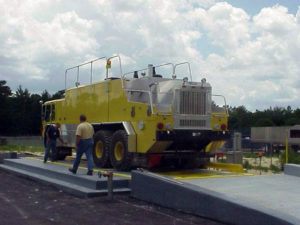 The scissors lift includes an air-over-hydraulic backup safety system that will support the engine in the event of a main cylinder failure. E-One, a leading manufacturer of firefighting equipment selected Bushman Equipment, Inc. to design and build a high capacity tilt table to test their new breed of fire trucks. Bushman designed one large, high capacity table as opposed to the two smaller independent tables that were previously used. Based on projected loads, the tilt table was built with a drive-on platform, 11 feet wide and 40 feet long, and with enough capacity to tilt loads weighing up to 150,000 pounds. Bushman Equipment, Inc designed and manufactured Arbor Lifts for a power plant turbine manufacturer. 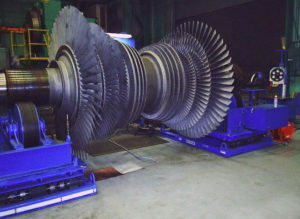 The Arbor Lifts significantly reduce the setup time for repairing turbine shafts. The old method required dozens of set-up fixtures, a unique fixture for every shaft size. The Bushman Arbor Lift handles up to 120,000-pound assemblies that are 15 feet long.